The Radiological Society of North America held its 92nd Scientific Assembly and Annual Meeting (RSNA 2006) from November 26 through December 1, 2006 at McCormick Place in Chicago, IL. More than 61,000 people attended this year's meeting, and >730 companies filled 514,800 square feet of exhibit space. The following is a brief review of some of the new technology that was featured at RSNA 2006. At RSNA 2006, Barco (Kortrijk, Belgium) introduced its latest line of gray-scale diagnostic display systems, showcased a new online service for high-grade Quality Assurance (QA) of picture archiving and communication system (PACS) display systems, and previewed 2 advanced visualization applications. Barco's new Nio line of gray-scale display systems, available in 2MP, 3MP, and 5MP resolutions, are driven by a high-speed BarcoMed Nio display controller, featuring the company's proprietary AURA technology. With 64-bit peripheral component interconnect (PCI) performance, the systems are capable of a download speed of up to 230 Mb per second. When combined with the optional BarcoMed Nio PCI Express display controller, the system can download up to 320 Mb per second with 1024 simultaneous levels of gray. The systems also feature the company's Backlight Output Stabilization (BLOS), which is designed to provide fast power-up and continuous Digital Imaging and Communications in Medicine (DICOM) compliance. It also comes equipped with a protective front cover to shield the LCD from damage. The Nio display systems also feature the company's new MediCal QAWeb service, a secure online service providing automated DICOM calibration, QA, display asset management, problem solving, and reporting functions. According to the company, this new service was developed "to optimize the availability and DICOM-precision of all the PACS display systems within a facility." To install, the MediCal QAWeb Relay is added to the facility's PACS. Once installed, the system permanently monitors all display systems throughout the facility to ensure maximum availability and compliance with DIN-6868-57, AAPM TG18, or other regional quality guidelines. DICOM calibration and QA tasks are performed automatically in the background and, should a problem arise, the system immediately notifies the proper person. The system architecture also incorporates a central MediCal QAWeb Server that provides a variety of remote capabilities, allowing users to log in from anywhere inside or outside the hospital and check the status of every display or add additional displays. When required, corrective action can also be performed re-motely via the MediCal QAWeb Server, which, as an added safety measure, resides in a secured environment hosted by Barco. MediCal QAWeb is offered at 3 service levels: Essential, Advanced, and Premium. The Essential service level provides a basic feature set for QA and remote support and includes a 2-year warranty. The Advanced level features additional capabilities for QA and asset management, as well as extended remote support functions and a 3-year warranty. The Premium level includes a full array of advanced services for asset management, remote support, extensive reporting, and a 3-year warranty. This highest level of service also includes added hardware services, including a single-swap, color-matched display replacement on the next business day in the event of a hardware failure. In addition to the currently available products shown, Barco previewed 2 works-in-progress at RSNA 2006: ColonMetrix for computed tomography (CT) colonography and a new positron-emission tomography (PET)-CT fusion application to its Voxar 3-dimensional (3D) suite. 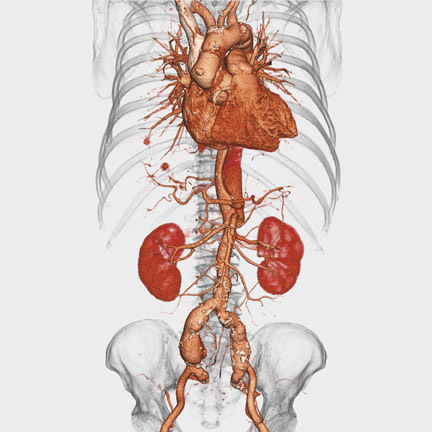 Voxar 3D ColonMetrix, which the company plans to fully integrate into the Voxar 3D platform, was designed to allow radiologists to interpret a CT colonography study and generate a report within approximately 10 minutes. It incorporates a variety of advanced tools designed to supplement traditional 2-dimensional image review, including the ability to perform real-time manipulation of colon image data with accelerated 3D fly-through, and has integrated computer-assisted reader and DICOM reporting capabilities. Voxar 3D PET-CT Fusion was designed to support the interpretation of whole-body fluorodeoxyglucose (FDG) oncology studies and allow real-time interaction with PET, CT, and fused volumes (Figure 1). According to the company, powerful automation and visualization tools have been added to make the detection and interpretation of lesions in PET-CT imaging faster and more accurate. The company expects both Voxar 3D ColonMetrix and Voxar 3D PET-CT Fusion to become commercially available in the United States in 2007. FUJIFILM Medical Systems USA, Inc. (Stamford, CT) unveiled a new line of direct radiography (DR) products at RSNA 2006. At the center of this product line is a new DR detector that the company notes was designed to provide "the highest spatial resolution and superb detective quantum efficiency." This detector is being introduced in the company's Velocity-Ufp and the Velocity-Tfp digital X-ray systems, which are both part of the company's fully integrated digital room replacement, SpeedSuite. The Velocity-Ufp, which will begin commercial shipment in the first quarter of 2007, is a compact reader for chest and other upright exams, with a throughput of up to 240 images per hour. The Velocity-Tfp is a new table system designed to accommodate patients weighing up to 506 pounds, with the same productivity as the upright system. The company expects to begin shipment of this system during the second quarter of 2007. The third component of the new DR product line was shown as a work-in-progress. The SpeedSuite Unity is a flexible U-arm system designed to be used by both hospitals and outpatient imaging centers for a full range of imaging studies (Figure 2). Pending regulatory approval, Fuji expects the SpeedSuite Unity to be available in mid-2007. Following the launch of the company's Computed Radiography for Mammography (FCR m ) full-field digital mammography system in 2006, Fuji also focused on digital mammography at RSNA. In particular, the company announced that, with the upcoming release of Synapse PACS version 3.2, the system will include additional digital mammography capabilities. According to the company, version 3.2 will extend Fuji's proprietary Reading Protocol technology that will offer reader-specific preferences to be set, which will provide consistent screening workflows and the flexibility to accommodate the challenges presented by diagnostic mammography. These reader-set preferences will be able to be used across multimodality women's imaging, including ultrasound and magnetic resonance (MR) imaging. In addition, Synapse 3.2 will include support Mammography Quality Standards Act (MQSA) compliant overlays, the integration of computer-aided detection (CAD), and the company's Access Over Networks compression algorithm. The company expects to release Synapse 3.2 in the second quarter of 2007. In other mammography news, the company announced a U.S. distribution agreement with Siemens Medical Solutions (Malvern, PA) through which Siemens will add Fuji's FCR m system to its product portfolio for both new and existing Siemens' customers, complementing their own MAMMOMAT NovationDR system. "Siemens has had a successful presence in the mammography market, and this agreement is an example of how we can leverage their breadth of experience so that our products get maximum exposure to decision makers," said Andrew Vandergrift, Fuji's National Marketing Manager, Women's Healthcare Imaging. "We're looking forward to a successful, collaborative relationship, and to helping spread the adoption of Fuji's clinically proven FCR m technology so that digital mammography is accessible to more women in the United States." Siemens Medical Solutions (Malvern, PA) previewed, as a work-in-progress, the ACUSON Antares system, premium edition, which will feature new elasticity imaging technology (Figure 3). According to the company, this new ultrasound imaging technique is expected to allow physicians "to accurately distinguish characteristics of breast lesions, more clearly demonstrating relative tissue stiffness or hardness, infiltration, and cystic regions." Based on initial research conducted by Richard G. Barr, MD, PhD (Professor of Radiology at Northeastern Ohio University's College of Medicine and Radiologist at Southwoods X-ray and MRI in Youngstown, OH) and presented at RSNA 2006, it is hoped that this new capability may reduce reliance on breast biopsy procedures. "In our work, elasticity imaging has been found to have high specificity," said Barr, who studied 166 breast lesions using this technique. "If our results can be reproduced in a large, multicenter trial, this technique could significantly reduce the number of breast biopsies required." The Antares system, premium edition, will also be equipped with the company's tissue stabilization technology, Advanced SieClear Spatial Compounding, and its Dynamic TCE Tissue Contrast Enhancement for speckle reduction and improved contrast resolution and image presentation. In addition, this system will feature new volumetric imaging and automation capabilities with available options, including the new Fetal Assessment Application and Advanced fourSight technology. Siemens also showcased its new High Performance Imaging release for the ACUSON Sequoia ultrasound system. Like the Antares system, the new Sequoia release includes the Advanced SieClear Spatial Compounding technology and Dynamic TCE capabilities. In addition, 2 new transducers are expected to be available soon for this system: the 17L5 HD transducer, a high-density ergonomic probe for imaging of small body parts, breast, and subtle pathologies; and the 9L4 transducer for cerebrovascular, peripheral arterial, and deep venous imaging. 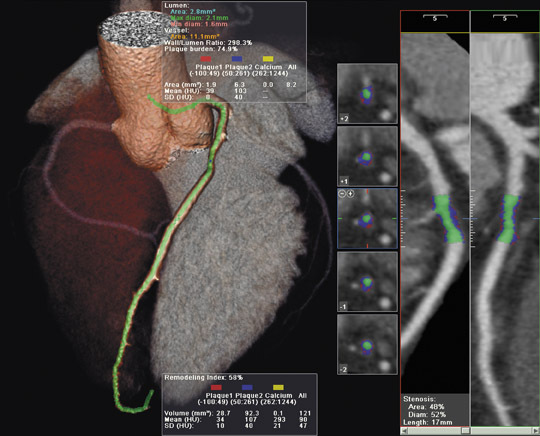 New advanced clinical applications are also expected to be available for the Sequoia system, including syngo Mitral Valve Assessment for 3D evaluation of mitral valve morphology and pathology and the new syngo Arterial Health Package for intima-media thickness measurements. Siemens also featured the company's new X Class products, the ACUSON X300 and X500 ultrasound systems, at RSNA 2006. Both of these lightweight, fully featured systems are equipped with the company's ErgoDynamic imaging system design and a variety of clinical capabilities. The X500 system was designed for a range of radiology and cardiology applications, and it includes optional transesophageal and stress echocardiography capabilities. 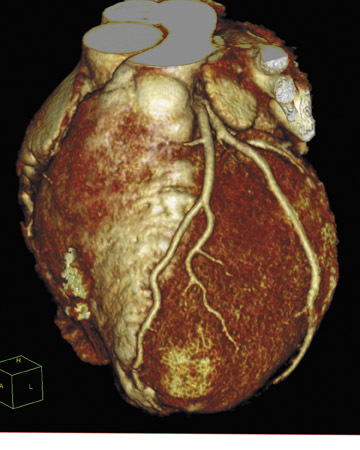 Available features include fourSight 3D/4D imaging and the syngo Arterial Health Package technologies. The system's TGO (tissue gain optimization) PLUS feature optimizes tissue gain and brightness in both the axial and lateral planes with the push of a button. The system also features a 17-inch flat panel display, an articulating arm, and a height-adjustable and customizable control panel. The X300 is an ultracompact system designed for use in such settings as the emergency department. It also features TGO technology for consistent image quality and advanced Hanafy lens transducer technology designed to provide improved image uniformity when scanning patients who are technically difficult-to-image. Siemens also showcased a variety of products in other clinical areas, including its recently approved syngo Lung CAD, which is designed to assist in the detection of solid lung nodules in CT examinations of the chest, and the MAGNETOM Trio MR system, Siemens'first MR system capable of 3T whole-body imaging with Tim technology. The company also highlighted its new MammoTest prone table, which is designed to offer clinicians the choice of upright or prone stereotactic breast biopsy systems. This system features 360˚ lesion access, polar coordinate targeting, and a high-resolution fiber optic camera. Planar Systems, Inc. (Beaverton, OR) featured the Dome EX series of gray-scale display solutions at RSNA 2006. Designed to provide a value-added display solution to specialty markets, the EX line is built on the company's Dome DA(4) architecture, allowing for up to 1024 calibrated shades of gray. "Diagnostic images viewed on Dome EX displays can exhibit the finest details, and the fourfold increase in calibrated gray shades provides a truer representation of the original digital data captured by the device," said Patrick Herguth, Vice President and General Manager of the Medical Business Unit for Planar Systems. "The technology to display 1024 calibrated gray shades exists in every EX panel via the DA(4) architecture. We have just been waiting for the graphics controller and software operating systems to evolve enough to take advantage of our technology." The new display systems are available in 2MP (Dome E2), 3MP (Dome E3), and 5MP (Dome E5) resolution. The company also offers a solution that combines 2 high-fidelity Dome gray-scale displays with one Dome E4c color display, designed to allow the user to use the Dome E4c for 3D reconstructions, cross-sectional data sets, and worklists while still having a high-fidelity gray-scale representation on a dedicated Dome E3 or Dome E5 display. E-Z-EM, Inc. (Lake Success, NY) previewed, as a work-in-progress, its first MR-compatible contrast injector system, EmpowerMR, at RSNA 2006 (Figure 4). Based on the company's EmpowerCT injector systems, the EmpowerMR features the same user interface and safety features as the CT systems in a format designed to not interfere with the MR scanner. The new injector uses a hydraulic control system instead of shielded electrical control components. It has no shielded iron motors, piezoelectric motors, or electrically active motor-control circuitry adjacent to the scanner, which, the company notes, is expected to minimize the possibility of electrical interference with the scanner's magnetic field. The system, which is not battery operated, links to its electrical supply by a single pass-through cable that does not require special shielding. The company also announced at the meeting that it received marketing clearance from the U.S. Food and Drug Ad-ministration (FDA) for its EmpowerSync system, a product based on the CAN-CiA (controller area network-[CAN] in automation) DSP 425 protocol. This system enables the synchronized operation of EmpowerCT and EmpowerCTA injector systems and CT scanners from all manufacturers who adopt the DSP 425 standard. The CAN-CiA DSP 425 protocol, an internationally recognized standard for data transmission between scanners and contrast injector systems, permits automated and coordinated operation of both the scanner and the injector system from the scanner's control system. Vital Images, Inc. (Minnetonka, MN) featured a theme of "The ViTALCommunity" at RSNA 2006, highlighting the company's focus on "relationships empowered by comprehensive solutions," including Vitrea software, the Web-based ViTALConnect solution, the VitreaACCESS system, ViTAL U educational programs, and its ViTALPerformance maintenance and services program. Highlighting its flagship software, Vitrea and Web-based ViTALConnect, the company demonstrated how by working together with VitreaACCESS these systems "provide the power and speed of workstation applications bolstered by the communication and distribution flexibility provided by the Internet." They showed how physicians using Vitrea 3.9 can manipulate studies to create key images, then push them to the ViTALConnect 4.0 solution, where users anywhere within the enterprise can restore the Vitrea workflow and continue further analysis and manipulation utilizing a Web interface. VitreaACCESS-Remote extends this capability by allowing radiologists to access their advanced visualization desktop from a remote location through a virtual private network. "We've worked very closely with customers to understand the complexities in their workflow and to simplify those workflows through elegant software solutions," said Susan A. Wood, PhD, Executive Vice President of Marketing and Product Development for Vital Images. "The result is that ViTAL is able to provide our customers with anywhere, anytime access to clinically relevant ad vanced visualization and analysis solutions customizable to fit the needs of their enterprise." The company also showcased their ViTALPerformance program, which offers automatic software upgrades for the life of a solution, as well as remote diagnosis, and the interactive clinical protocol assistance program, ViTALAssist. The company's education center, ViTAL U, offers courses designed to provide hands-on training in such areas as vascular, thoracic, and cardiac applications. These courses are offered throughout the year at the company's Minnesota headquarters as well as online, at regional road shows, and, by request, at facility sites. Technology and Industry: RSNA 2006 review: Part 1. Appl Radiol.